This was another of those 'close but no cigar' kind of games against one of the big teams. With Bony starting on the bench, Laudrup has made it clear that he feels having both him and Michu starting leaves too little support for the midfield when playing against top 6 teams (which is a perfectly reasonable viewpoint). It might seem strange to pay £12m for a striker to then leave him on the bench but the purchase of Bony (and Shelvey) should enable Swansea to turn possession into wins far more often against lower teams in the league and I'd expect us to get far more points than in previous seasons against the teams that end up in the bottom 5 or 6 places. 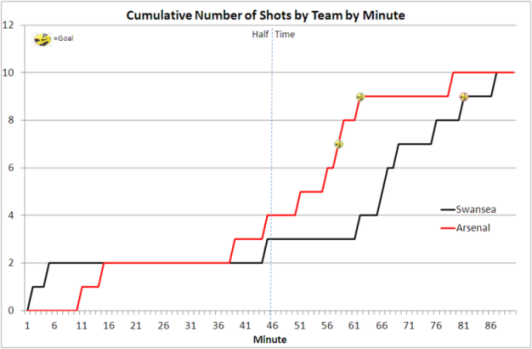 The first half (apart from the late chance for Giroud) probably went as well as Laudrup could have hoped for. It was a pretty cagey opening with the ball mainly in the middle third and both sides having sufficient numbers back that there was little opportunity to create chances. The second half Arsenal stepped up a gear and created a number of chances aside from the two goals. Swansea then in turn had a number of attempts of their own but aside from the well worked goal for Davies, pretty much all these attempts were speculative long range efforts. 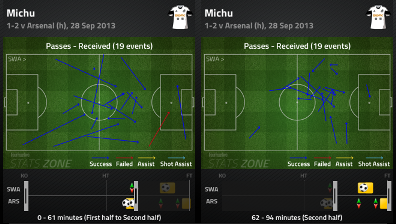 Bony ended up with the most attempts for Swansea (3) with Michu not having a single attempt in the 90 minutes. Michu received the ball as many times in the half an hour after Bony's introduction as he did in the hour before hand (this will be down to Swansea chasing the game as well as his change of position). Some of Arsenal's counter attacking highlighted the need for increased midfield presence and the fact that Ozil was relatively quiet shows how well this worked for most of the game, it'd be great to see Swansea go toe-to-toe with the likes of Arsenal even if over the long run keeping it tight is arguably the right solution. It was good again to see Pozuelo have some impressive touches when he came on. I think he could have a real influence coming on as a sub on a regular basis with 25-30 minutes to go as his quick feet could make a mockery out of tired defences.